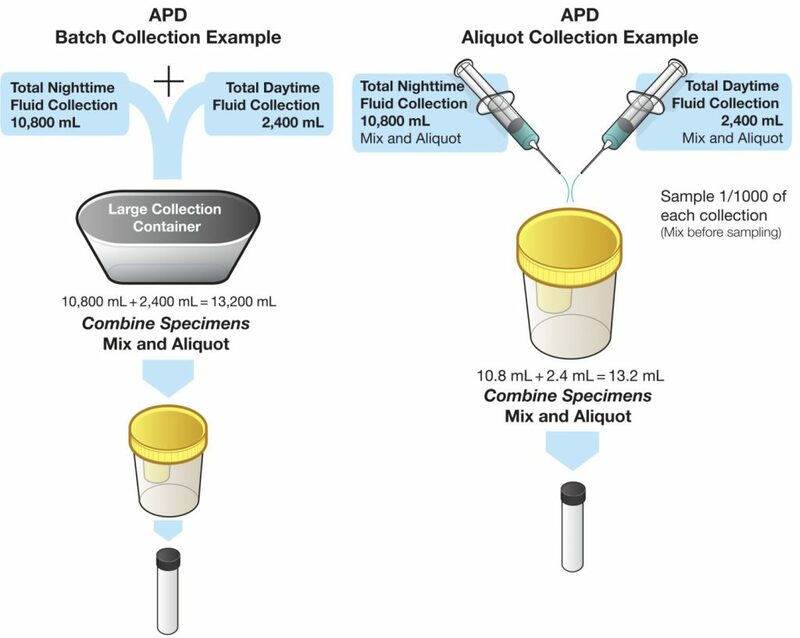 There are two methods for collecting specimens for PD Adequacy testing: Batch and Aliquot. Measure and record the total amount of nighttime fluid drain collected. Measure and record volume of daytime dwell, including any manual exchange. Combine all volumes in a large container. Record total drain volume. Pour an aliquot of the mixed specimen into the Cup so that it is 3/4 full. Secure lid. Peel back protective sticker on the Cup’s lid to expose the transfer port. Insert the stopper of the Black Top Tube into the transfer port. This will pierce the stopper and allow the tube to automatically fill. Remove the tube. Use the bar code label with patient’s name and ID to identify the specimen. Measure and record the total amount of nighttime fluid drain collected. 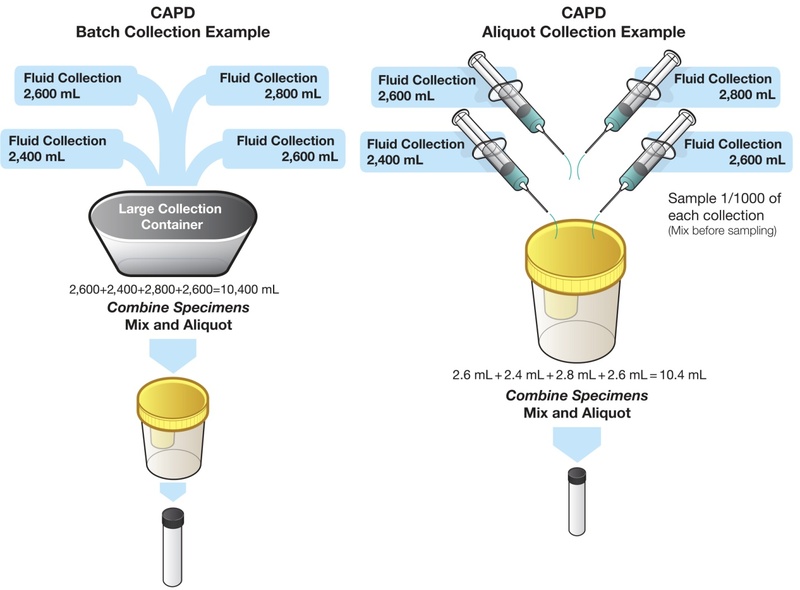 Remove 1/1000 of the volume and add to Sterile Cup with Transfer Port (Yellow). For example, a total fluid volume of 10,800 mL would require a specimen of 10.8 mL. Measure and record volume of daytime dwell, including any manual exchange. Remove 1/1000 of the volume and add to the Cup. For example, a volume of 2,400mL would require a specimen of 2.4 mL. Record total drain volume (nighttime and daytime). Secure lid. Mix specimens in the Cup. Peel back protective sticker on the Cup’s lid to expose the transfer port. Note: If less than 20 mL is aliquoted, the Cup may need to be tilted to avoid drawing air into the Black Top Tube. Measure and record the total amount of fluid drain volume for each bag collected over a 24 hour period and add contents of each bag to a large collection container. Record total drain volume. Pour an aliquot of the mixed sample into the Cup so that it is 3/4 full. Measure and record the total amount of fluid drain volume. Remove 1/1000 of the drain volume to a Sterile Cup with Transfer Port (Yellow). Repeat for each fluid bag collected over a 24 hour period adding each specimen to the Cup. Record total drain volume. Secure lid. Mix the Cup. Note: If less than 20mL is aliquoted, the Cup may need to be tilted to avoid drawing air into the Black Top Tube. Remove the tube. Do not centrifuge. Use the bar code label with patient’s name and ID to identify the specimen.